To the people that have one and a V8, is the handle slimmer on the KPB? It might just be pictures messing with me. Hmmm... I might know somebody who has one of those. What kind of KPB98 did you get? Actually just scored a comp w grey or green (cuz ‘they look the same’) AND a TGA2 from twiztids4. My first private sale and didn’t have a clue what I was doing but got er done cuz he’s an outstanding fellow hog w the patience of a saint. David Lennon and PeteyTwoPointOne like this. The dimensions on the micarta appear to be the same, but the metal on the FMV8 is a little thicker (.250 vs. .210), so the handle is too. Actually I nixed the hunt for maroon. I was made an offer I couldn’t refuse on a grey (or green cuz ‘‘they look the same”) V8 comp AND a Special Edition TGA2!! Thanks for asking. The KPB98 is comp, orange g10 so the orange boar skull pattern from Dave Brown will be perfect. A radical blade deserves a rad sheath. Can’t wait to see how Dave tackles the Kris’ curves. Hopefully Busse will be at Blade 2019, if there was even a knife that deserved CS wooden handle, the KPB is it. Let's hope they'll have a few at Blade. My KBP arrived yesterday. All three are tan canvas. Lots of variation and I dig it. evltcat, Leonardo63, MacLaren1 and 2 others like this. Do the nukes say custom shop like the V14's do? It seems unlikely. The nuclear option was just a free handle upgrade for the first few ordered. It wasn't an extra-cost option, and it didn't have anything to do with the blade finish. Just got it so this is a tease. This piece deserves to be shot on a set. Nuked orange g10 so I’m more than pleased. Mine should be here next week sometime. David Lennon, back_inthe_saddle and Still Voracious like this. Hahahh! Great! So it wouldn’t be too early to email you my order? It would be so wrong to sleeve this outstanding knife in anything other than that hog skull pattern. Your designs are so consistently perfect for each knife that comes your way, I’m ordering it sight unseen. An FMV8 and a Special Edition TGA2 came my way so I’ll be adding 2 basic black pancakes to the order. 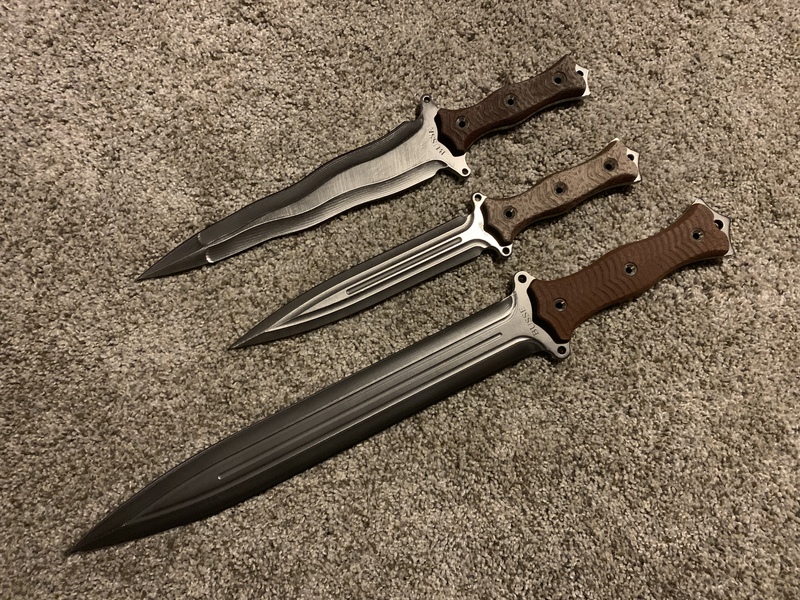 I just reached that goal of the perfect trifecta of Busse daggers. Jerry has a way of satisfying the OCD knife nut’s craving for sharp pointy symmetry. n850gt, those look GREAT! Congrats. back_inthe_saddle, TheMtnMan, gorshi and 4 others like this.